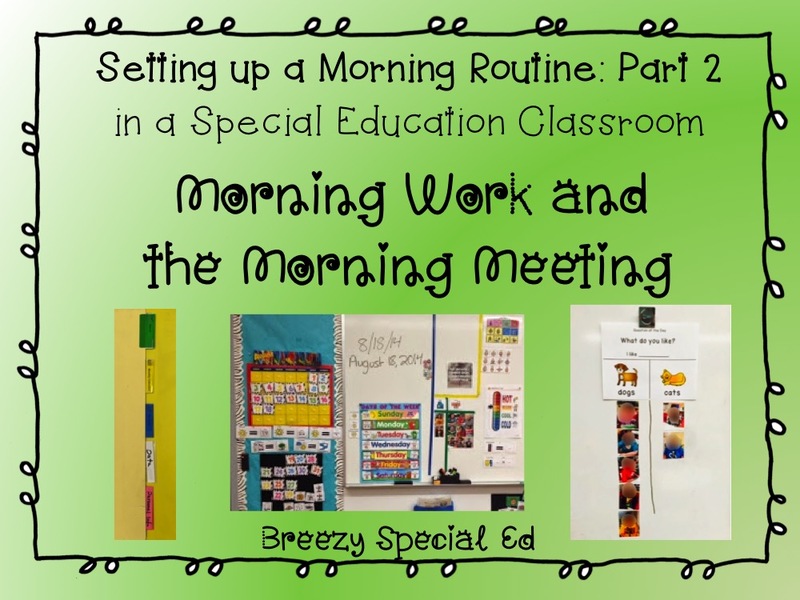 I love our morning routine and morning meeting in my special education classroom! 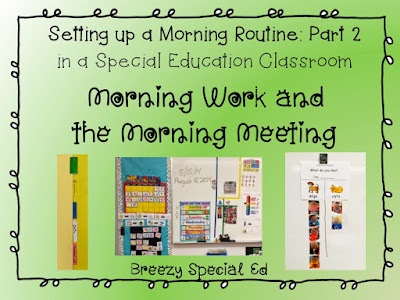 It goes so smoothly because it is structured and my students know what to expect every day. After everyone has signed in and completed their jobs (see part one of our morning classroom routine), we start our morning meeting. Wait, Pause! Not all students will complete their jobs at the same time. Sigh, if only we lived in a perfect universe...however, I have a solution for that. First, if I can add something to the job, I go right ahead and make the job a little bit more work for them. Second, remember how they grab their binder with the schedule and their sign in sheets? I keep morning work for them in there too. I focus on two different types of work in our morning binders. Personal Information worksheets: For my lowest students, these were laminated sheets where they traced their initials or worked on sorting "their name" and "not their name". For my other students, I created a fading personal information worksheets, where they would trace / write their name, address, phone number, birthday, etc. 3 times and I would lighten the font as they went down the sheet, and slowly take away tracing support so that they were working on memorizing their info as well. 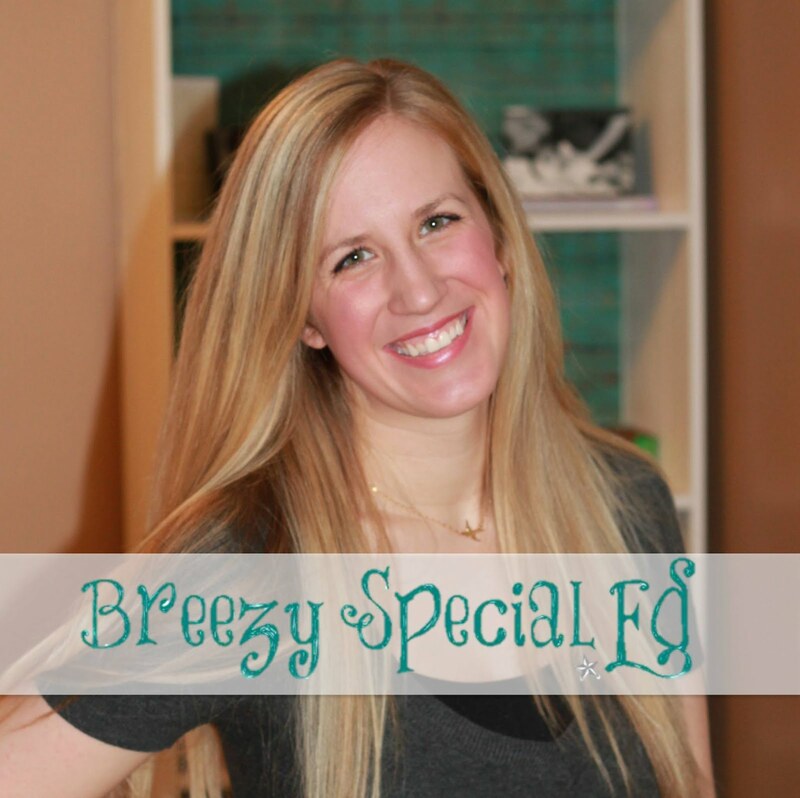 See these editable personal info practice sheets here! During our morning meeting, we will go over a question of the day. 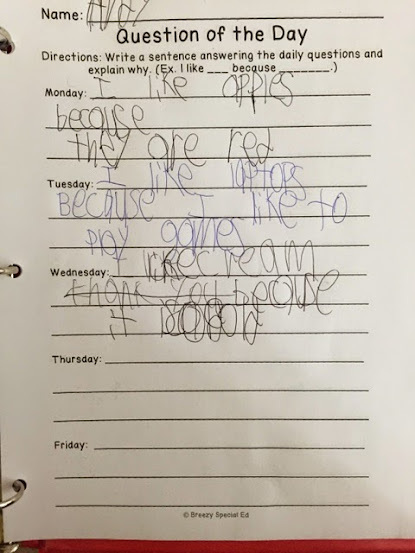 I have different levels of journals where students can draw their answer for the day, write their answer for the day, or even write an entire sentence that include why about their choice (as pictured above). An entire week is on each page. This helps students prepare to answer the question later on as well (but is not necessary, not all of my students have time to complete this before our meeting time). And for some of my device users, I will have them prepare their sentence, or at least practice saying, their sentence during their extra time as well. Let the Morning Meeting Begin! Okay, now that you have succeed at keeping everyone busy and everyone has completed their jobs, you are ready to begin your morning meeting! (This is typically about 10-15 minutes after the bell has rung for my class). As a high school teacher, I try to give my students as much control and responsibility over this part of the day as I can. So, the first thing I do is ask who would like to go first (we work a lot on volunteering, raising our hands, saying "Me", etc, in my class). And yes, I sometimes have to model this my raising my own hand and saying "I want to go!" Note: for some students this will cause anxiety, I have also done a schedule on the board of the order when needed. Students then take turns explaining what they did for their job to the class. The jobs that students come up for are calendar, weather, attendance, and lunch. I also make sure to thank students who did our other jobs so that they realize their part is also important. Read more about our jobs in part 1. Basically, the students do exactly what they did for their job, just in front of the class. 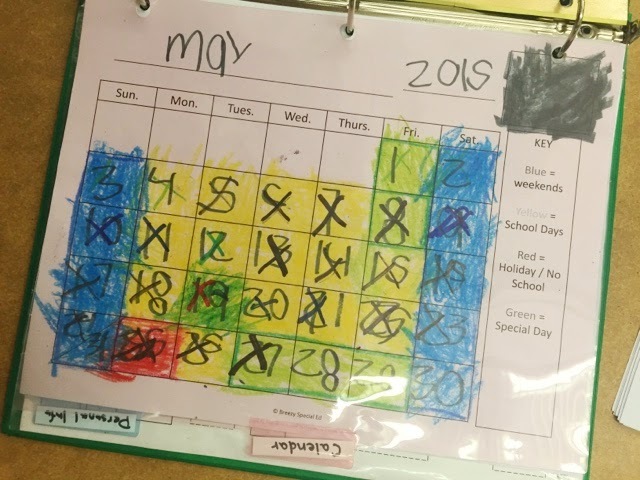 I do add a couple of things, such as during calendar time, each student turns to the calendar tab in their binder and crosses off today's date, because we already woke up and made it to school today! Then we might look at what's coming up and I'll briefly mention a few things. 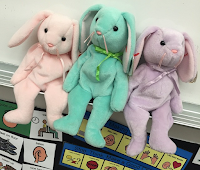 Read about how we use our visual calendars and grab a set of calendars for your classroom here. I also try to make this student-led (granted, with a lot of assistance) part of the morning meeting interactive, so when a student explains the weather, other students might also check the weather on their iPad to make sure that student got the information right. Or after a student states something, I'll ask other students in the class to make sure they are grasping the concepts as well. After those parts are completed, we go over the daily question. This is my absolute favorite part of our morning meeting! I pick a student to lead this, and that student will go around and ask each student, "what do you like?" and after the student answers, the leader will go to the white board and move their picture under the correct answer. This is so great for working on listening and speaking skills! Then when we are finished, I usually quickly go over how cool it is that we like different things and what some people have in common, etc. 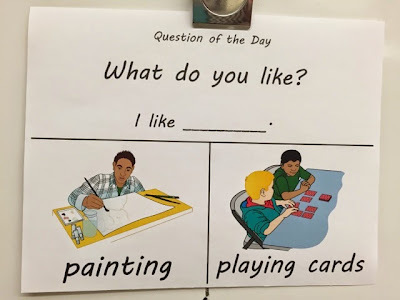 Read more how we use our daily questions in this blog post and purchase this pack of questions for the year in my TpT store! We also end our morning meeting with classroom greetings. 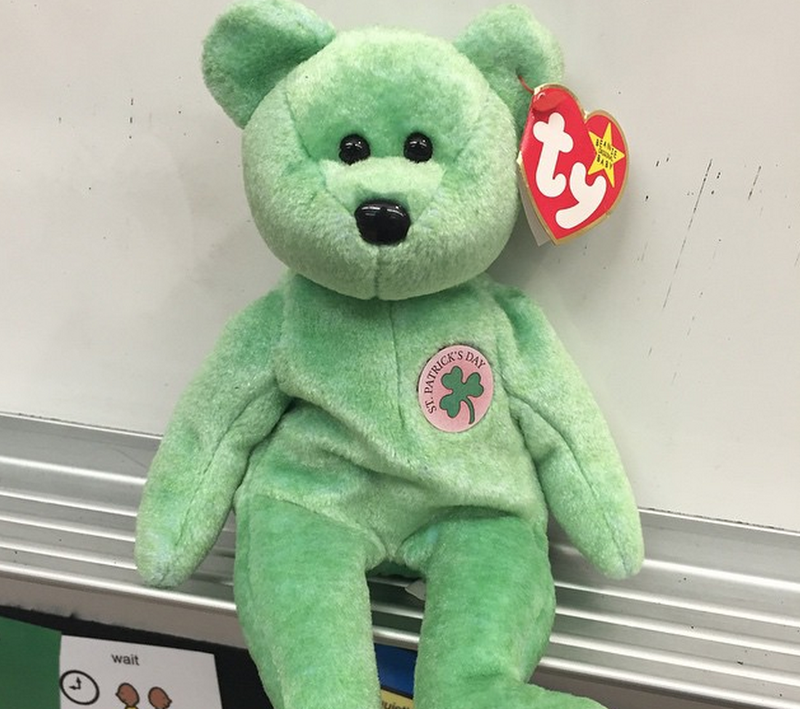 This might be kind-of silly, but I have an animal, usually a beanie baby, that I switch out each month as our class pet or mascot. And the pet mascot "chooses" who will lead our greetings for the day. I will pretend to throw him, or trick students by going to them and then switching it to something else, or placing it on top of a head! They think this is hilarious! (Again, if a student is anxious about not knowing, work a deal with him and let him know when he is going to have his turn ahead of time). The person chosen then leads our greeting for the day, and goes around and says hi to each of his/her classmates along with a high five, handshake, or fist bump. That wraps up our morning meeting, which usually lasts about 10-15 minutes and then students check their schedules and start their individualized programing!